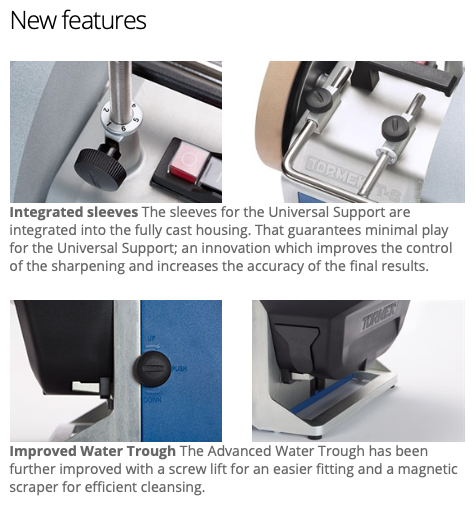 The advanced design ensures an unbeatable precision for the Universal Support, which is the foundation of the Tormek sharpening system, since it controls all grinding jigs and accessories. The former mounted sleeves for the Universal Support are now integrated in this model's fully cast machine housing. This update will increase the accuracy in your sharpening. The characteristic drive system of Tormek is also implemented in this new model. The efficient system manages to maintain a constant speed, even under full load - something unique for Tormek’s sharpeners. Tormek Original Grindstone SG-250 sharpen all qualities of steel, including HSS. The powerful AC motor is designed to drive the full size grindstone during continuous use.